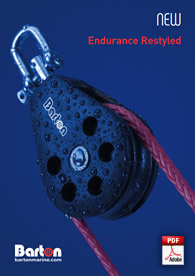 Due to the formidable success of its High Load Low Friction Eye/Ring range, Barton Marine has launched a new size Eye with a 9mm bore for use with control lines up to 4mm. The Safe Working Load is rated at 550kg yet the weight is a staggering 3grams! The light weight, low, profile design features two flexible coated fibreglass rods which provide the force to support the boom. When I commissioned my J24, I fitted a large number of the Barton deck fittings. The Jib and Genoa tracks, complete with Genoa cars with a plunger stop, for example, are still going strong, showing no sign of wear or tear. The low profile, short length traveller combined with the modular components made it reasonably easy with the Barton Engineers to design an excellent system for my boat. All helping me win the Class Championships eight times. Manufactured from a composite Kevlar/Zytal material which offers performance advantages including, strength weight, wear resistance and greater holding power. By popular demand Barton Marine introduces a range of stainless steel rubbing strakes, to help prevent rope wear to deck edges and coamings. Available in three lengths these attractive strakes are easy to fit and will last a lifetime. The Barton Furling Gear is available in two sizes for use on jibs fitted to Dinghies, Catamarans and Day Boats. Furling Drum (part no:42334) for maximum sail area up to 5.74sqm; or Furling Drum (part:42335) for max. 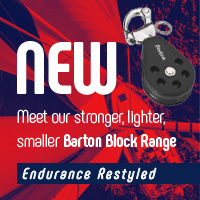 In terms of durability, smooth operation, and value for money, Barton blocks are hard to beat. I can honestly say that throughout an 86 day, 1720 nautical mile voyage in fairly unpleasant weather at times, the Barton Blocks were superb. Using an improvised "bosun's chair" from cordage, which was carefully secured to the main halyard, I was absolutely confident that, with the halyard passing through the Barton block system, I could successfully hoist my (none too light!) crew member aloft. Manufactured from marve grade aluminium and spectro grey annodised for high UV stability and durability. Sheaves are precision turned from solid "Ertalyte" bar with a profile that is kind to modern ropes. You will notice a continuous 316 stainless steel hoop fitted into the base which allows for wear free, smooth adjustment of the control line from any angle before being cleated into the K Cam. Spectrocolor 2000 is a special bonding process that gives a smooth, tough finish and improves longetivity. 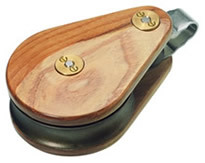 It is unique to barton in the marine deck hardware market. Only 12 centres around the world are approved by Henkel for this application, we are proud to be associated with SPA Aluminium Ltd to bring you this unique technological advance in aluminium anodising. With a need to sheet in the Genoa more accurately for racing purposes, the Barton mini-tracks with cars provided a great solution. Easy to fit and straightforward to use, their impact on the Genoa set was immediate with much improved windward performance. So much so, that we won the Discovery Trophy for the Modern Gaffers Class in the 2009 Round the Island Race. 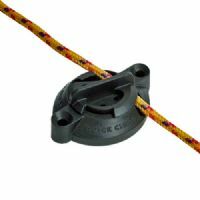 The Barton mini turning blocks secured to the aft mooring cleats allowed the powerful gennaker to be easily and accurately controlled by the sheet man. Suitable lines from 8 to 12mm. Using the latest lightweight materials enables fantastic performance, at minimal weight and bolt together construction allow for easy servicing. Barton Marine's new Carbon Fibre and Kevlar wear and protection pads and discs are available now in all good Chandleries throughout Europe and the USA. Produced with a special high performance 3M pressure sensitive adhesive backing, the new wear pads show excellent resistance to edge lifting, immersion and exposure to salt water. The system makes reefing your mainsail a quick and easy operation. Just lower the sail to a pre-determined mark on the halyard, tension the reefing line and trim the sail – all from the cockpit. Last season we fitted a Barton two-car mainsheet (windward sheeting system), which requires no adjustment from tack to tack. Irrespective of whether the cars are above or below the centreline, the traveller is simple, economical and very effective even under the heaviest of loads. 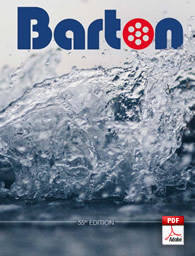 Thank you Barton for giving us the performance we require at an affordable price. The Boomstrut has not only stopped the problem of the boom dropping when lowering the main, but is also of considerable benefit when reefing. I am very happy with the performance of the Barton equipment, it puts up with a lot of use and mileage and never lets me down. Available in four sizes to suit 20mm, 25mm and 32mm T Tracks .